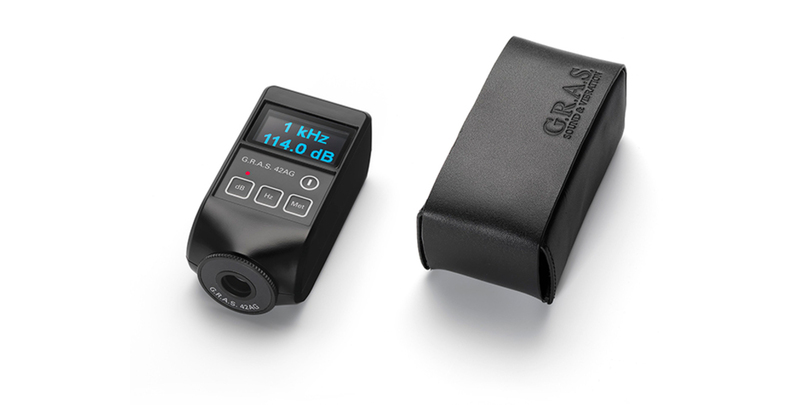 The GRAS 42AG Multifunction Sound Calibrator is a portable, battery operated sound source for calibration and check of microphones and sound level meters. It is designed for field use and comes with a protective casing. It conforms to the requirements in IEC 60942 for a class 1 sound calibrator. It can produce a sinusoidal signal of 250 Hz or 1 kHz at 94 dB or 114 dB. For documentation purposes, 42AG provides display of the environmental conditions: ambient air pressure, temperature. The sound is generated by a small loudspeaker integrated in the acoustic coupler. An internal reference microphone measures the level in the coupler and a feed back circuit automatically adjusts the level. Therefore, the calibration level is virtually independent of ambient conditions like temperature, atmospheric pressure and humidity within the specified range of operation. The calibrator has been designed to serve 1” and smaller microphones and sound level meters equipped with such microphones. 1” microphones fit directly in the calibrator coupler, while 1/2”, 1/4” and 1/8” microphones are served by application of adapters that are part of the delivery. The calibrator is powered from two type LR03 alkaline batteries (AAA-size). lf the voltage supplied by the batteries is too low to ensure proper operation, the calibrator will automatically switch off or not switch on. 42AG is designed to fulfil the need for a portable and versatile calibrator for field use. Also, it is designed to be the logical replacement or upgrade from existing calibrators. 42AG represents improved functionality and user friendliness. Its combination of portability, automatic level adjustment and two calibration frequencies and levels makes it a complete and self sufficient solution that can be used to perform a complete field-verification without the need for other instrumentation, e.g. for recording ambient calibration conditions. With two calibration frequencies, 250 Hz and 1 kHz it is well suited for calibration of microphones that normally are calibrated at 250 Hz as well as sound level meters which normally are calibrated at 1 kHz. 42AG can calibrate at two different levels, 94dB and 114 dB. The 114 dB is a level that suits microphones with medium sensitivity, while the low level of 94 dB makes it possible to calibrate microphones with high sensitivity without overloading the microphone. Level and frequencies at reference conditions (23,0°C/101,325 kPa/50% Relative Humidity) - levels in decibel relative to 20 µPa.